Suspended Fifa president Sepp Blatter and vice-president Michel Platini could face seven-year bans from football if found guilty of corruption claims. Fifa ethics investigators are likely to have recommended the sanctions over a "disloyal payment" that saw Platini, 60, receive £1.35m from Blatter, 79. 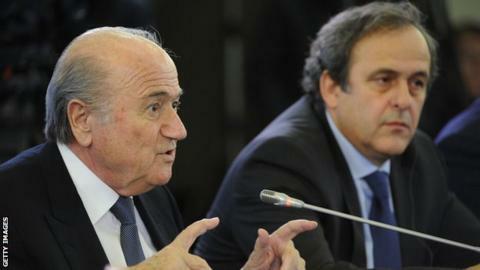 There was no written contract for the consultation-work payment, which Platini received nine years later. The adjudicatory committee intends to announce its verdict by Christmas. Both Blatter and Platini, who is also the president of European football's governing body Uefa, are serving 90-day provisional bans. The pair have denied any wrongdoing, stating they had an "oral contract" for the work. However, they are thought to be facing additional charges including mismanagement, false accounting and failure to co-operate with the ethics committee. The adjudicatory committee, led by German judge Hans Joachim Eckert, opened proceedings on Monday, although a verdict will not be announced until next month at the earliest. Fifa said the reports had been studied "carefully" but that it would not publish details of the sanctions requested, though its ethics investigatory committee is likely to have pushed for a minimum seven-year ban for both Blatter and Platini. This is based on the similar length of time that Harold Mayne Nicholls - the man who wrote the technical inspection reports for 2018 and 2022 World Cup candidate nations - received for breaching "conflict of interest" rules. Meanwhile, Platini, who still hopes to replace Blatter as the next Fifa president in the February election, has taken his case against his suspension to the Court of Arbitration for Sport (Cas). Swiss Blatter, who has had recent heath problems and claimed on Monday that he had been "close to dying", is also likely to appeal to Cas. Frenchman Platini wants his suspension overturned, his case heard quickly and his ban lifted pending Eckert's final judgement.